A few of us have broken bilstiens. Instead of creating a new thread I decided to add to an existing one. I am trying to determine if I want a long travel kit or just standard lift with Upper Control Arm (UCA) replacement. I like the Total Chaos suspension product. I also heard from Mike that the group has experienced good luck with RadFlo shocks. I am seriously considering the RadFlo stage 6 kit at Metaltech. I have had issues with geometry in the past on other vehicles so was thinking of asking for the UCAs with Heim Pivots instead of what they put in the kit. Does anyone have feedback on this? Now to long travel. This seems to add a bunch to cost but I would think it would give lift while maintaining geometry closer to stock on the axles. Does anyone run long travel kits on their rig? Any opinions pro or con? I only want to do this once so I want to ask the questions first. 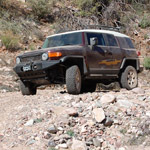 I am not going to do extreme rock crawling and plan to do more overland stuff. With that being said I don't mind being over engineered. Once I have the lift on I will start adding the weight and expect I will have to upgrade springs at some point but not today. My truck is stock now but will not be for long. Thanks for any feedback. I am also going to post on Facebook. The kit is extended travel. I am also considering long travel which requires an axel change. I really do not know what long travel gives me other than more width and I would expect better geometry when extended. If your just doing overland stick with regular width extended travel. That is what I am thinking as well, stock width extended travel. I am looking at maybe sourcing items from a local distributor. Still researching and will probably purchase end of week. Thank you for the input. I have no complaints with my bilstein shocks. Have them for 2 years now and they are still working great. Icon is definitely a good brand. They are pricey though. Many people don't feel quite the same about Icon after using them. Icon is definitely a good brand. They are pricey though. 1) many people have complained about the ICON rear springs sagging over time. I might have to agree with that at this point. 2) Not too impressed with the rear shocks... even the 2.0 version. 3) THIS IS SERIOUS: the FJ Cruiser forum is awash in posts complaining about ICON quality (failures) and poor service these days. Clearly something has changed since I got the original Donahoe's. The only post that was positive was from two brothers that had them for 10 years and 11 years respectfully. Basically, the same as me. For this reason I am not comfortable getting more ICON's now that I have 100K on the vehicle. So, now what? 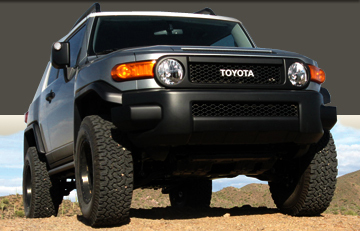 Has anyone used Fox coilovers and rear shocks on their FJ? A lot of people on this and other forums used to like ToyTec (which I believe are RadFlos)? Anybody still like them? I see they have several options now. Ralph Waldo Emerson once said, “To be great is to be misunderstood"
I still have not upgraded my suspension as I over think things. I think people still like RadFlo and I think Bryan Glider was a reseller. I don't think you can miss with King either. Go radflo and you’ll likely be happy. NOT TOYTEC. Built under the same parent maybe but totally different. Get yourself some 2.5s with resis and you’ll be happy. Bryan Glider can likely hook you up. Those are what I have on my 3.5 Long Travel and with the abuse both I and 4 gauge have put them through you’ll be good for a while. Thanks. I was actually thinking about skipping the reservoirs this time. Had them with and without. I'm not working it as hard as I used to. Sounds like I need to talk to Bryan... maybe he can explain the compression adjuster option. I don't understand what they do? They literally adjust the compression dampening. How stiff the shocks are. So they are a knob or something on the shock... or are they only on the reservoirs? For anyone that has them, how well do they work? Are they just for stiffening, or can you go both directions... softer and firmer?